It's the time of year when I cannot resist taking my morning cup of coffee out to the garden to see what has transpired there, seemingly overnight. 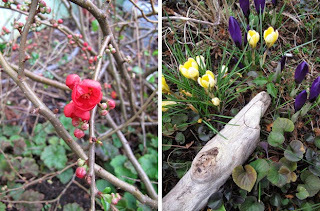 New buds appearing on the fruit trees, the first crocuses unfurling on the south side of the house, patient daphne odora teasing me with the promise of bloom and heavenly scent. But frosty mornings and heavy ground slow my impatient hands, and so instead of digging and sowing seeds, I keep them warm around my mug and wait, with anticipation, for Spring to unfold. 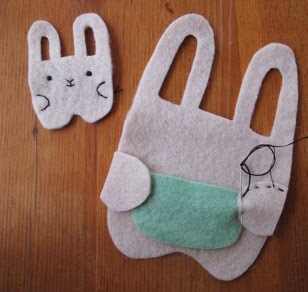 One of our new designs for Spring 2013 is a bunny rabbit that holds a baby in its pouch pocket. It's great for little hands that love babies and putting small pieces where they belong. It's available for a limited time in the Kata Golda Etsy boutique, but more adventurous crafters may enjoy making their own. The combined set is approximately 4.25" in width by 6.7" tall, and can be stitched by hand or with a sewing machine. 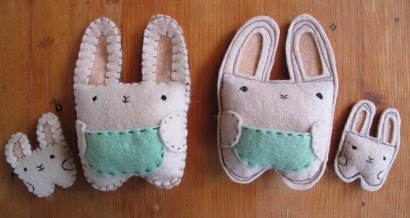 The bunny on the left was stitched by hand; the one on the right was machine stitched. Print the template and cut out the template pieces with paper scissors. Then place the pieces on the felt and cut out the felt shapes with fabric scissors. 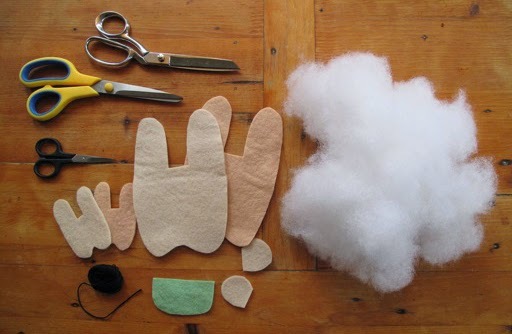 In the front pieces of both the little and big bunny bodies, use small snips to pierce the felt and cut out holes for the ears. Little bunny: Stitch the face and hands on the little bunny using 3-ply black embroidery floss. Satin stitch the eyes directly below the center of each ear; use a double running stitch to create the nose, mouth and hands. 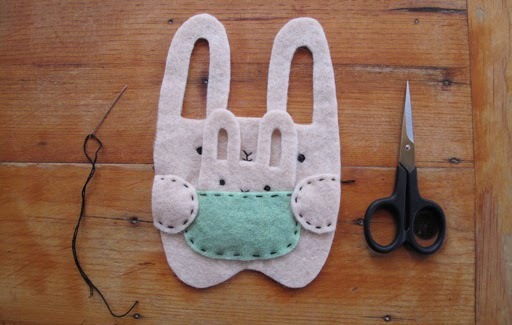 Big bunny: Place the pocket and hand pieces on the front of the body, using a running stitch to attach them. Make sure you don't stitch the top of the pocket closed — only stitch the top of the pocket through the green felt, but then stitch through all 3 felt layers at the places where the hands overlap the pocket. You'll only sew through 2 pieces of felt along the bottom of the pocket. To determine the location of the big bunny's facial features, place the top layer of the baby bunny in the pocket. Ideally the eyes are placed on the outside of each of the little bunny's ears and the nose/mouth is placed between the ears. Sew on the features just as you did for little bunny. By hand: With 2-ply thread, whip stitch around the inner edges of the ears. 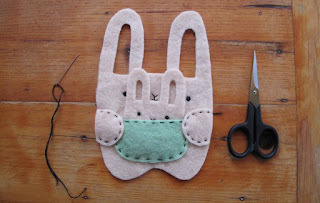 Starting on one of the sides, blanket stitch around the bunny, leaving an opening along the side to add stuffing. By machine: Machine-sew a straight stitch around the inner edges of the ears, and then continue around the outer edges of the bunny, leaving an opening on one of the sides to add stuffing. Repeat these steps for the little bunny, and add stuffing to both bunnies. This example shows a hand-stitched big bunny. 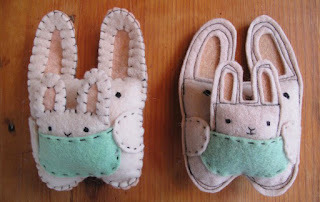 To finish each bunny, continue your stitch and close the hole. If you are using a machine, finish by sewing a straight stitch around the outer edges of the bunny (the outer edges should have 2 lines of stitching around it). Try to keep the stitch depth and length consistent. When whip stitching and blanket stitching, I make my stitch length and depth between 1/8" – 1/4". Bundles of wool felt squares in various colors are also available from KataGolda, and include ten sheets of 6.5" x 6.5" hand-dyed felt. What is your favorite springtime tradition? Email your response and mailing address, with "Spring Inspiration Give-Away" in the subject line, to information@katagolda.com by Sunday March 24, 2013. The two winners will be notified by email and sent their kits on March 25. 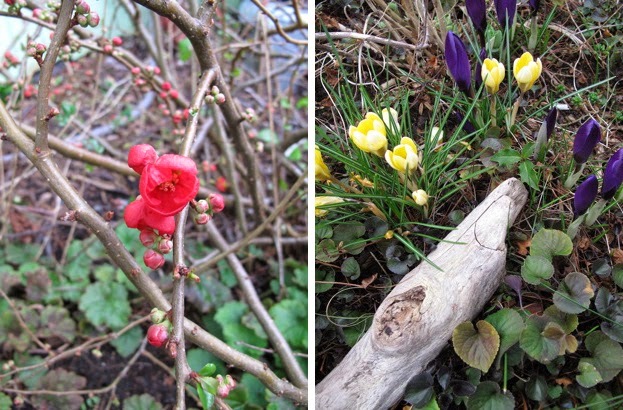 This is so sweet of you to share.I love your work.Happy spring.